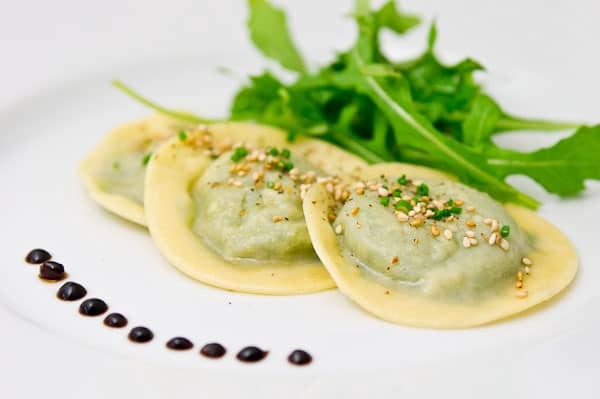 These Asian inspired raviolis are filled with ricotta, arugula, shiitake mushrooms, tahini and water chestnuts. Creamy, nutty, peppery and crispy! 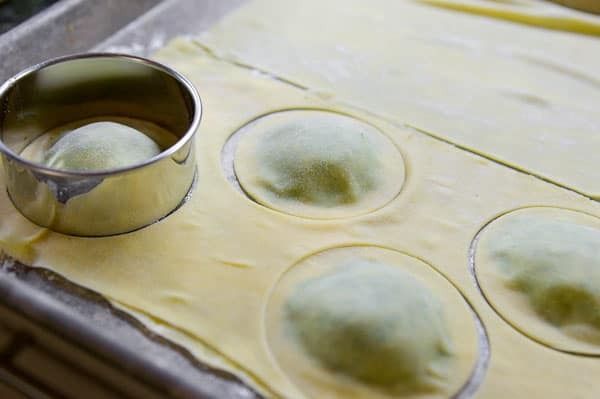 Lately I’ve been seeing recipes using water chestonton wrappers to make ravioli or tortellini. It’s a neat time-saving idea, but I don’t see how using wonton wrappers makes them “Asian”. It did get me thinking though, about how you could make an Asian inspired ravioli that Marco Polo would be proud of. He may not have brought pasta back to Italy, but he was one of the first Europeans to travel so extensively throughout Asia. Purists may disagree, but I believe it’s possible to reinterpret a classic dish without desecrating it. That’s why when I’m interpreting a dish, I first start with the fundamentals: What makes the dish what it is? What things can be changed? What things can’t be changed? In the case of ravioli, the dough, shape, and certain aspects of the filling are what make a ravioli a ravioli. Stray too much from those and you’ll just end up with a wonton, or something completely different. After setting down a few ground rules, it also becomes easier to figure out ways to add familiar tastes and textures into an unfamiliar place. For this ravioli, I decided to season the filling with shiitake mushrooms, soy sauce and tahini. Some roughly chopped waterchestnuts go in for texture, and I used some blanched arugula as the bridge to tie the Asian and Italian sides of the dish together. The peppery arugula and nutty sesame work great together, as do the creamy tahini and ricotta. After mixing up a batch of the filling and giving it a taste, I had to restrain myself from eating it all straight from the bowl. It was that good. Creamy, nutty and savory it had the right balance between freshness and richness that kept it from getting too heavy. Wrapped in pasta dough, boiled and drizzled with toasted sesame oil, it’s even better. The balsamic reduction is what really makes these things pop though. The sweetness and acidity are exactly what the raviolis need to contrast the richness and to bring out the umami in the filling. Serve a few of these on a plate as an appetizer, or toss them into a soup. I could even see these being deep fried as a party appetizer served with a tomato relish. Put the flour and salt in the bowl of an electric mixer and whisk together. Add the olive oil and eggs and mix together until it comes together into a ball. Attach the bowl to a mixer fitted with a dough hook and knead until the dough is smooth and satiny. Cover the dough with plastic wrap and let it rest while you make the filling. Blanch the arugula by putting it in a glass container, adding about a tablespoon of water, covering with another glass plate, and microwaving for 1 minute. Remove the lid, let it cool enough to handle, then squeeze as much moisture out of it as you can. Heat a small saute pan and add the olive oil. Saute the shallots, garlic and shiitake mushrooms until the mushrooms have given up most of their moisture (about 10-15 minutes). Let this mixture cool down to room temperature. Add the arugula, onion mixture, marscapone, ricotta, tahini, soy sauce and salt to a food processor and process until smooth. Add the water chestnuts and pulse a few times to roughly chop them up (there should still be chunks). Prepare an egg wash by whisking together an egg with 1 tablespoon of water. Heat the balsamic vinegar, honey and demi-glace in your smallest sauce pan. Once the demi-glace has disolved and the mixture is thick and bubbly, it's ready (this shouldn't take long). I poured the mixture into a mini squeeze bottle to make the dots, but you can also just pour a bit on the plate and smear it with a spoon, or just drizzle it on top of the raviolis. Cut off a quarter of the dough and flatten it out on a floured surface using your hands or a rolling pin, then pass it through the rollers of a pasta maker starting from the thickest setting and working your way down to a thinnest, passing the dough through at least 2 times per setting. If the dough starts to stick, just dust some flour on it. Lay the dough out on a long flat floured surface then repeat with another quarter of dough. When your second sheet is done, line the sheets up and trim off the ends so they are exactly the same length. 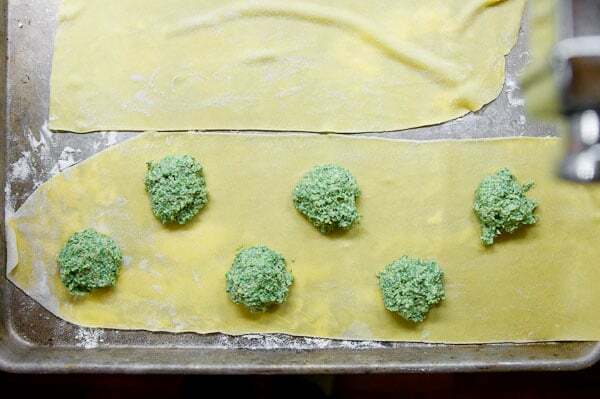 Place 1 tablespoon of filling a few inches apart, leaving room around the edges of the dough so you can seal the raviolis. Be careful not to overcrowd the dough or you'll have a hard time sealing the raviolis properly. Use a pastry brush to paint the egg wash all around the filling. Drape the other piece of dough over the first piece and use your fingers to start sealing each ravioli starting from one end. It's crucial that there aren't any air pockets with the filling as the air will expand while cooking and your ravioli will burst. The best way to do this is to seal one side, then use two fingers to trace the outline of the filling starting fromt he side that's sealed, then seal off the other side, and you should be good. I used a round cookie cutter that's 1/4" bigger than the filling mound on both sides, but you can also cut your ravioli with a knife. If you are freezing the ravioli, place them on a floured cookie sheet and freeze them. Once they are frozen you can put them in a ziplock bag, but they will stick together if you don't freeze them separately first. To cook the ravioli, bring a large pot of water to a rolling boil, then turn down the heat to maintain a gentle boil. If you have a very large pot you can cook all 18 at the same time, but I just cooked them in two batches. Drop the raviolis in and then they float to the surface they are done (this won't take very long). Drain the ravioli and transfer them to a bowl. Drizzle with sesame oil, add a handful of arugula, and sprinkle with salt and pepper and toss to coat. Serve the ravioli with the balsamic vinegar reduction. Sprinkle some toasted sesame seeds and chives on top to garnish. That looks sensationally good… you’re totally working the fusion with style. Definitely something I want to eat! Will definitely try this out!! Yummmmm. so beautiful! love the ingredients in this filling. I’ve never thought about this,I might try it.Thanx for the idea. This sounds almost too goo to be true. Love. gorgeous (almost to beautiful to eat)…and not at all “desecrating” (LOL)!!! I’m bookmarking this. I still have yet to try homemade pasta. Thanks, Marc! And it’s beautiful as always! Marc these are absolutely gorgeous. Love the bright colour and the flavour of the arugula against the earthy shiitake mushrooms! Bookmarked. tahini! yes what a great idea to use tahini as part of a filler. excellent marc. Bookmarked! Amazing photos, as usual [jealous]. love the recipe…love the photos! Thanks! Neat idea to mix the two cultures. I love the addition of water chestnuts. Great idea. Thanks for the immaculate post and great detailed text. Much appreciated. Beautiful! 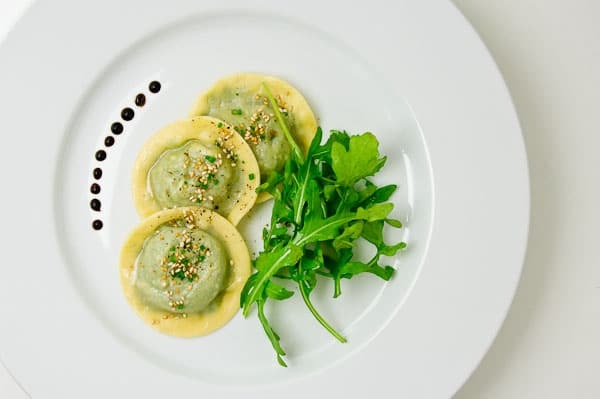 I love the idea of a green Asian-Italian fusion ravioli. It is totally making me crave fresh pasta right now. Mostly it just seems like that wonton ravioli would taste nothing like pasta at all! That balsamic reduction just takes it over the top. Lovely. I’ve never attempted ravioli, but these seem too delicious and beautiful to not attempt. Gorgeous blog, glad I found you! This sounds delicious. I’ve used wonton wrappers many a time instead of pasta! I completely agree. Your presentation is utterly divine, although I’m a little saddened there are only three on the plate… I could probably wolf down many more! Wow, this is a beautiful and simple recipe. The mushrooms, shittake, arugula, and (the surprise ingredient) chestnuts sounds delicious. btw… I’ve always admired your blog from far away. What a great recipe. Wonderful photos! and I love the addition of honey into the balsamic reduction! Thanks for sharing! These ravioli look really good …. that’s coming from someone a little fussy about her pasta! I never tried ravioli on this way. It seems challenge for me to make them. Usually i buy them already packed and i just boil them. I think i will try to make them based on this guide. Reading about the idea of making ravioli with Wonton wrappers, I gave it a try and it was a real abomination. Definitely NOT recommended! Going the other way around (Asian filling) is a much better way to go!